I'm here with the human, Helen watching that World Cup thing the humans are obsessed with. Well most humans are, thankfully mine isn't! She doesn't seem to care about it at all which is great for me cause she brought me shopping for a present for you! Ireland is nice, very green and no snow. Human says there's never snow in June so I should stop looking for it every morning but I think she might be lying to me. It has to snow right? My human is very strange, she doesn't eat fish but eats a lot of something called chicken. I don't mind chicken but I'd rather have a good fish! Just don't tell grandma penguin I tasted weird food, you know what she's like when she hears about foreign food! I've discovered a new love for a thing called chocolate. It's brown and tastes delicious! Humans love it too! 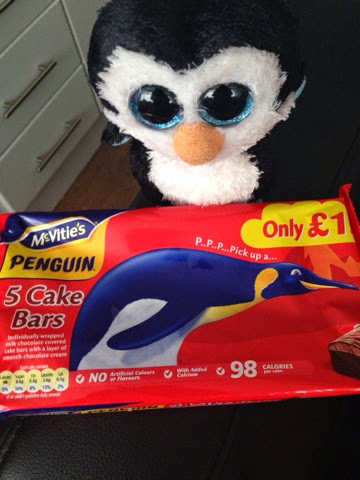 My favourite kind is one called a penguin bar! It's really yummy! I could eat them all day (with fish) but the human says I'd get fat! I don't think she knows that I need my fat to stay warm! Anyway, my human isn't all bad. She brings me on adventures and to see strange things. We went to the zoo in Berlin and to a spelling bee. It's fun! This week she says she's bringing me on a surprise trip! Oh in Ireland it's Father's Day! That's a special day where the humans celebrate great dads, my human got her dad a present so I got you one too! 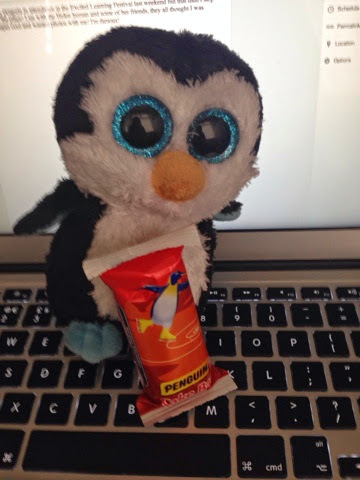 Here's a packet of penguin bars! Especially for you! Now don't say I never get you anything! I'm a great little penguin! Say hi to mom and grandma and all the family! It's fish time here so I can't write all night, and you know how difficult it is for us penguins to type!